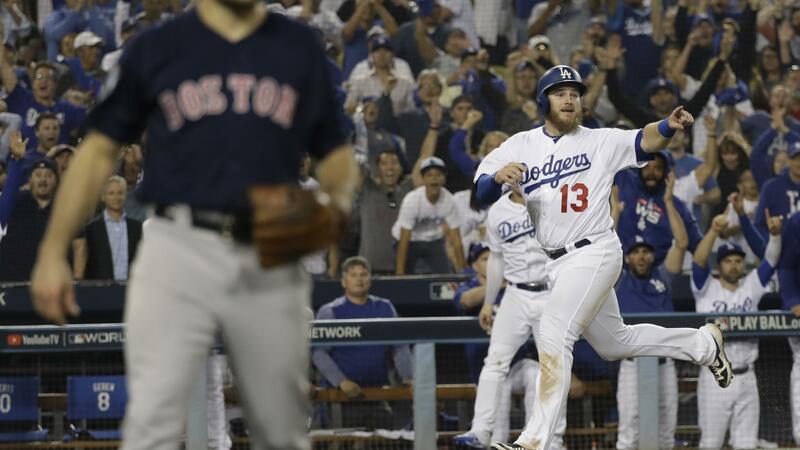 A GRIP ON SPORTS • Where were you when Max Muncy won Game Three of the World Series with his 18th-inning, opposite field home run? I was in front of the TV set. As I said on Twitter before I finally called it a night, I consider it the most impressive accomplishment of my athletic career. Read on. • The real final score last night: Baseball 18, Bedtime 1. An 18-inning game led to a 1 a.m. bedtime. But how could you throw in the towel? It was the World Series. It was a 1-1 game then a 2-2 game and the innings just kept rolling along. Besides, if Larry King, who probably attended the last World Series between these two franchises, can stay awake, how can I go to bed? But there he was, his glasses reflecting the Dodger Stadium lights, sitting – and occasionally standing (with help) – in the front row behind home plate, looking more awake and engaged than Dave Roberts ever does. So we soldiered on, waiting for someone to move a guy around the bases to end this, the longest game in postseason history – and longer than a couple of Larry’s marriages. But the modern baseball theory – swing as hard as you can every time because sooner or later you will run into a pitch and drive it out of the park – finally worked, with Muncy lifting an almost 100 miles per hour pitch over the left-center field wall. I felt like this little guy in the bowels of the Dennis Quaid’s “Waterworld” tanker when the match hit the oil. “Thank God” were the only words I could think to utter. And then I made my way upstairs. En route to the perfectly prepared bed, I ran into the woman I am related to by marriage. She was on her way back down to give it another go. Too late. Like life, last night’s game couldn’t last forever. It only seemed like it. WSU: So who is the biggest opponent this afternoon at Stanford. The imposing home crowd? (I always like to start with a joke.) The big, bad Cardinal? (That’s not at the same level it was the past few years.) Or a letdown after last weekend’s win over Oregon? I’m all in about the last one. Theo Lawson writes about it as well. … But in the final analysis – literally – Theo doesn’t seeing it making a difference in who wins. … The volleyball team just keeps on rolling. … The Times has a pick for the game. … Stanford is all in with stopping Gardner Minshew and the WSU passing attack. Will the Cardinal do it with pressure or with coverage? My guess would be the latter. Elsewhere in the Pac-12, the first story you need to read is this piece from the Oregonian’s John Canzano. He wonders if there was interference with replay review long before it came to light. … Washington has a break this week, facing California. Though the game is in the Bay Area. … It could have been an incredibly exciting quarterback matchup. But with Khalil Tate’s injury, today’s game between Oregon and Arizona is about one star. … Oregon State travels to Colorado trying to find that elusive first Pac-12 win. … Quarterback injuries will play a part in today’s USC game with visiting Arizona State. … The football weekend began last night in Pasadena but not too many folks in Southern California were interested. And neither, it seems, was UCLA. Utah won in a 41-10 rout. Gonzaga: Larry Weir spent some time with Hoopfest executive director and former GU star Matt Santangelo talking Zags. And the S-R’s upcoming Zag Legends event. It’s all part of the latest Press Box pod. EWU and Idaho: The answer is 1994. The question is: The last time Eastern hosted Idaho, the team from just down the road. Ryan Collingwood has a preview of today’s rivalry game. … Ryan also has a Q&A with Kole Karstetter and a look back at the brief history of what should become one of the best football rivalries in the area – eventually. … Around the Big Sky, Northern Colorado will face Southern Utah with the loser probably finishing last in the conference. … UC Davis hopes to stay in first with a win at Montana. … Idaho State will unleash its potent offense on a Montana State team in the midst of change. … Weber State travels to North Dakota. Whitworth: The Pirates can basically clinch the Northwest Conference crown with a win today over Pacific. Dan Thompson previews the Pine Bowl game. Chiefs: Spokane returned from its long road trip and showed no ill-effects. The Chiefs were efficient in their 4-1 win over the Portland Winterhawks. Kevin Dudley has the game coverage. By the way, the Winterhawks have a really cool looking bus. I saw it yesterday as it was pulling into the Arena. Preps: The fall sports playoffs are either underway in Idaho or winding down. In the underway category, football last night featured a last-second comeback win for Post Falls. Jim Meehan was there and has this story. … In the winding down category, Lake City is in the semifinals of the State 5A volleyball tournament. … Over on this side of the line, Dave Nichols was at Albi last night as Gonzaga Prep clinched the GSL 4A title and Shadle Park did the same with the 3A. Jesse Tinsley also has a photo report from the 4A game. … We can offer a roundup of other football games as well. Seahawks: With this week’s game in Detroit, it will be a homecoming of sorts for Frank Clark. But he won’t be able to supply a pass rush by himself. … The Hawks will honor Paul Allen the rest of the season. … The offensive line has had something of a breakthrough this season. Published: Oct. 27, 2018, 9:02 a.m.